Reginald Carl Harmon was born in 1900 on a farm in Olney, Illinois. His parents were direct descendants or early settlers of Illinois. At an early age, he accepted a schoolmaster's position at a country school. In 1922, he entered the University of Illinois. He began his law studies in the University of Illinois College of Law. In 1924 and received his bachelor of laws degree in l927. While a university student, General Harmon taught a Protestant Sunday School class consisting of university students. This religious teaching continued over a 10 year period. His average classes included some 100 to 150 students. During this period, and while teaching this class, he met him wife, Doris, also a graduate of the University of Illinois. From his earliest years as the youngest mayor in the history of the city of Urbana, Illinois, (1929-1933) and at the time the youngest in the United States of a town of that size, General Harmon set precedent and received national recognition as a bold and progressive administrator. In 1929, seizing the initiative amid a collapsing economy, he declared for his city the nation's first bank holiday closings to permit reorganization of the banks' assets, thereby averting bank failures experienced throughout the rest of the nation. Being the mayor of a university city, General Harmon soon found novel and unique problems not normally shared by mayors of other cities. The solution of these problems demanded the sageness of a city father and the wisdom of a university dean. He welded these qualities so well into his personality that he was returned to office for a second two-year term before returning to the practice of law. He has now been a member of the Illinois Bar for 30 years and of the United States Supreme Court Bar for 17 years. Notwithstanding the time demands of his duties as a mayor and as a private practitioner, General Harmon found time to serve and lead in a variety of fraternal and civic endeavors. At one time he was the state president of the National Exchange Club in Illinois, an organization of business and professional people. In the Order of Freemasonry he has attained the eminent positions of high priest of the Urbana Chapter of Royal Arch Masons and commander of the Urbana Commandery of Knights Templar. He holds active membership in the Order of the Mystic Shrine and the Phi Delta Phi legal fraternity. Outside of his official duties as the Judge Advocate General of the U.S. Air Force, General Harmon was active in civic and religious enterprises in the city of Washington, D.C. As long-time supporters of the National Symphony Orchestra, he and Mrs. Harmon (a musician in her own right) have consistently contributed much time and effort in the support of this and comparable cultural programs. His religious activities have found recognition in his selection as a ruling elder in the National Presbyterian Church, where he, Mrs. Harmon and their daughter, Susan, are in regular attendance. General Harmon's military career had its inception with the University of Illinois Reserve Officers Training Corps which was the source of his commission as a Second Lieutenant (Field Artillery) in 1926. In October 1940, he was called to active duty in the military service at Wright Field, Dayton, Ohio, as a major in the Army Reserve Corps. From 1940 through 1945, he was in charge of the legal representation of the United States government in the industrial expansion program to meet the needs of the Army Air Corps during World War II. In recognition of his outstanding service in this position, he was awarded the Army Commendation Ribbon and, later, the Legion of Merit. This official recognition of his merit as a government lawyer is particularly noteworthy. The Air Force has long been one of the largest businesses in the world. Billions of United States taxpayers' dollars were appropriated during World War II for the operation and needs of the Army Air Force. Money spent for aircraft, airfields, equipment, research and the like had to be spent in accordance with the law based on sound legal advice. This part of military law includes many functions, such as million-dollar contracts, vast procurement programs, taxation, litigation and patent laws. The inherent problems of such activities are frequent and complex. General Harmon's professional acumen enabled him to arrive at the most practical and economical solutions in this area of activity. It was primarily for this reason that he was so recognized by being awarded the Legion of Merit. 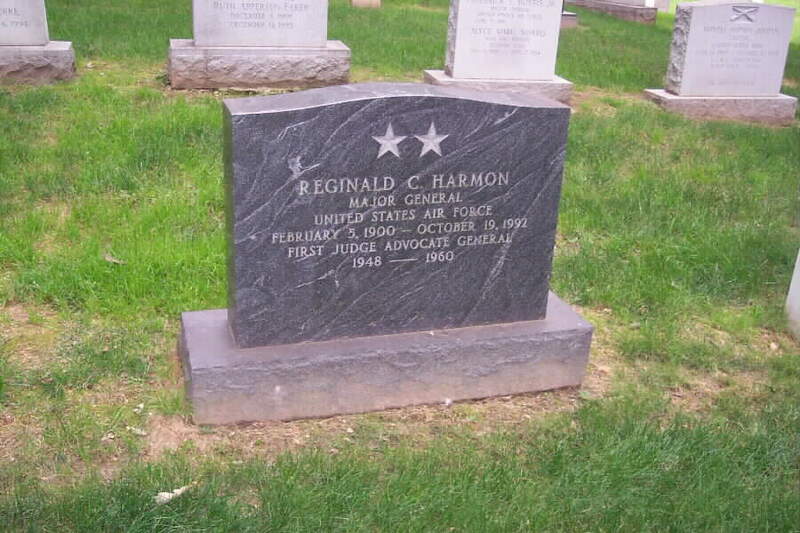 From l945 to 1948, General Harmon was the staff judge advocate of the Air Materiel Command at Dayton, Ohio. In 1946, he was commissioned in the Regular Army. When the Department of the Air Force became a separate service in 1947, General Harmon, then serving with the Air Materiel Command, was logically included in the nucleus for a Judge Advocate General's Department of the Air Force. On September 8, 1948, General Harmon (then a temporary colonel) was appointed by the president of the United States as the first judge advocate general of the U.S. Air Force and promoted to the temporary rank of Major General. In 1951, he was promoted to the permanent rank of Major General in the Regular Air Force. The general's tenure as the judge advocate general has been marked with the philosophy of maximum service with maximum economy. Placing a premium on initiative, resourcefulness and industry, he set out in 1948 with a small nucleus of officer-lawyers and civilian attorneys. He developed for the Air Force and the nation an unexcelled legal department of some 1,300 highly trained and qualified judge advocates. Initially, he personally selected and assigned outstanding and experienced personnel to ensure that only the highest caliber judge advocates were assigned to key legal positions in the world-wide Air Force operational network. To this framework he added young law graduates from the leading universities of the country. The high professional reputation enjoyed by the Air Force Judge Advocate General's Department reflects the soundness of General Harmon's selection of his judge advocate personnel. General Harmon's desire to maintain the highest professional standards for his new department prompted his early affiliations with the leading professional groups of the nation. He encouraged his staff and all members of his department to join and participate in the activities of the American Bar Association, Judge Advocates Association, Federal Bar Association, and state and local bar associations. He personally accepted the chairmanship of several committees of bar associations which are dedicated to improvement of relations between the military and civilian community. Illustrative of this leadership is the fact that General Harmon was chairman of the General Counsel's Group of the Federal Bar Association for the 1957-58 season which includes the chiefs of legal departments of the 45 agencies of the government. As the judge advocate general of the Air Force, General Harmon supervised a force of approximately 1,200 lawyers, and more than 1,600 nonlawyers who are assigned to more than 400 different legal offices throughout the world. He is also the legal adviser to the chief of staff, U.S. Air Force, and his staff. By federal statute, he exercises general supervision over the administration of military justice within the Air Force. During a normal year, the Air Force will prosecute in the name of the United States more criminal cases (about 36,500 per year) than are filed by the attorney general in the U.S. district courts. This tremendous responsibility in the field of criminal law is equaled, if not surpassed, by the many facets of General Harmon's civil law responsibilities - c1aims, military affairs, patents, 1itigation, international law and procurement counseling. The general always maintained an active interest in the field of lega1 education, addressing student groups, taking part in seminars on legal education (military and civilian) and maintaining close association in advisory capacities with committees on legal education. In 1950, he established the first Air Force Judge Advocate General's School at the Air University, Montgomery, Alabama, designed to indoctrinate young officer-lawyers in the performance of judge advocate functions. Under his personal direction, a curriculum comparable to a civilian law school was developed covering major fields of law which members of the Air Force Judge Advocate General's Department are required to know. This school found its justification and fulfillment during the Korean Conflict when it produced the large number of trained military lawyers required to meet the wartime mission. Also, the Air Force Judge Advocate General's School produced the experienced lawyers that presently administer the system of military justice in the Air Force. They represent the staff judge advocates of tomorrow's Air Force commands. On conclusion of the Korean Conflict, General Harmon directed that the school curriculum be maintained on a current stand-by status to meet any future emergency needs. Reflecting his usual adaptability to changing situations, he transferred training efforts of his young judge advocates (on suspension of school activities) to an on-the-job training concept. Turning each of his legal offices throughout the world into a training school, he assigned young law school graduates to his most experienced staff judge advocates for indoctrination in military law. His faith in the excellence of the civilian law school curriculums was rewarded when the test of time proved that young officer-lawyers could make the transition easily. General Harmon's tenure of office has been concurrent with some of the most revolutionary changes ever to take place in the field of military law. The Elston Act of 1948 and the Uniform Code of Military Justice in 1951 (act of May 5, 1950) provided for vast and far-reaching changes, both in the law and in procedures for the administration of military justice. These acts contained the first significant changes in the field of military justice in the history of this country. General Harmon's effective solution of the many complex and unprecedented problems incident to the implementation of this legislation and his efficient administration of the new codes created thereby are perhaps the truest measures of his ability and stature. General Harmon has been just as effective and successful in solving numerous civil law problems and in adapting his organization to great changes which have taken place in the administration of civil law by the military. Not being merely content with having his organization successfully handle a great increase in the volume of its regular civil law business, General Harmon has increased the areas of responsibility of his judge advocates and the scope of services performed by them. His policy has permitted the military to fully and effectively utilize the services of the military lawyer. Moreover, it has greatly enhanced the prestige and position of the Air Force lawyer by permitting him to demonstrate his value and importance to the service. Among the innovations introduced by General Harmon during his tenure as the judge advocate general of the Air Force was a new legal reporting system consisting of sets of volumes of military law. This system is now used by each of the Armed Forces. One set (the Court Martial Reports) contains the decisions of the Boards of Review in each of the Armed Forces, and the decisions of the U.S. Court of Military Appeals. The second set of volumes (Digests of Opinions of the Judge Advocates General of the Armed Forces) contains legal opinions of the judge advocates Ggeneral of particular interest to judge advocates in the field. Both sets contain headnotes, annotations, indices, case tables and citators, and are similar to reporter systems used by civilian courts and attorneys. General Harmon was of the opinion that, in order for these publications to be of practical use to interested personnel, it was essential that, editorially, both the composition, format, and general arrangement follow standard legal publications, and that they be keyed into standard reference material. Accordingly, the services of the Lawyers Co-operative Publishing Company of Rochester, New York, were obtained for these publications. This was the first time that a system of this kind had been established in the military service. It has proven very successful and has promoted the interservice application of the Uniform Code of Military Justice and other aspects of military law. Ever mindful that the quality of legal research is directly proportionate to availability of adequate research materials, General Harmon has always given high priority to procurement of law books, reports and other legal pub1ications. He also effectively supplements this program by maintaining a staff of experienced legal writers in his own office who devote their time and talents to the production of essential legal publications covering specialized fields of military law. The law libraries in Air Force judge advocate offices throughout the world in many instances now far exceed the available legal research material of most private practitioners. In practice, the accessibility of such adequate legal publications in these JAG libraries assures General Harmon and the Air Force that opinions written by Air Force lawyers are competent and complete treatises of applicable law. officer of the Air Force, he takes particular pride in addressing professional groups. Illustrative of these presentations is a speech delivered February 15, 1958, at Colorado Springs, Colorado, before the Judicial Conference of the Tenth Circuit of the U.S. Court of Appeals. This meeting included the federal judges and many of the judges of the supreme courts of the Rocky Mountain and Southwestern States, as well as a large number of the distinguished members of the bar of that area. Other speeches include those before the Federal Bar Association and the regional conventions of the American Bar Association in Chicago, New York and Dallas. He has also spoken before the House of Delegates of the American Bar Association. In 1952, he spoke at the dedication of the law center at Southern Methodist University. Being a military lawyer, most of his writings have been for military-type publications. Typical are those he has written for The Judge Advocate Journal, published by The Judge Advocates Association. This association is an affiliate organization of the American Bar Association, composed of 1awyers of all components of the Army, Navy and Air Force. Also, he has written legal articles for publications by the active Armed Forces, such as The JAG Journal, published by the Office of The Judge Advocate General of the Navy. He has written articles for some law school journals concerning the lawyer's role in defense. During his tenure as the Judge Advocate General of the Air Force, he has written many articles for various state and local bar associations. Pursuant to his characteristic determination to ensure preparedness, General Harmon personally supervised the activities of the Judge Advocate General Department Reserve which he established. Now in its eighth year, this group of 1,500 stand-by officer-attorneys provides an augmentative force to the regular establishment. These officers are thoroughly trained to meet emergency legal requirements of the Air Force. Through special training groups in various Air Force active duty headquarters and through legal training flights throughout the nation (93 principal cities). General Harmon establishes and maintains the professional standards and training received by Reservists. The quality of the legal courses offered to his Reservists is ensured by the fact that they are prepared by the general's staff of experienced creative legal writers. Two field grade officers are assigned to full-time duties concerning JAG Reserve affairs. "... Few men in our century have been given the opportunity to render dual service to their country and profession and have acquitted themselves in a more distinguished manner than has our medalist during his tenure as the first judge advocate general of the U.S. Air Force." This medal, established by Congress in 1918, is a peacetime award limited to recognition of service of national or international significance. It was fitting that General Harmon received this high award at the Pentagon, for it was from his Pentagon office that he successfully lead and directed the legal department of the U.S. Air Force during its formative years from 1949 - 1956. It is not only the military that has recognized General Harmon's vital service to his country and to his profession. In 1951, the National University School of Law, Washington, D.C., (now consolidated with The George Washington University School of Law), conferred upon him the honorary degree of Doctor of Laws (LL.D.) in recognition of his contribution to legal, education within and outside the scope of his official duties. In 1955 General Harmon was selected by the Department of State as one of the United States delegates to the First United Nations Congress In Geneva, Switzerland, on the subject of the Prevention of Crime and the Treatment of Offenders. Because General Harmon will be eligible for retirement in the prime of life and because he is energetic by nature, he repeatedly declined to consider lucrative post-service activities which do not represent service to the legal profession or to the training of younger lawyers for positions of responsibility to their government and community. Long an enthusiastic supporter of higher education, he is keenly interested in academic endeavors. His greatest interest lies in public or private tasks which will blend his administrative and legal talents with a busy and productive assignment. Country school, Richland County, Ill.
Olney Township High School, Olney, Ill.
Armed Forces Reserve Medal with one Hour-Glass Device with "X"
General Harmon was buried with full military honors in Section 30, Grave 490, Arlington National Cemetery.